After breaking another crappy wristwatch or sitting in front of a frozen computer, you are reminded of that pesky truth: if you want quality, you have to pay for it much like your first guitar. The same also goes for electric skateboards. Now that you know you want to add some boom to your boarding for your daily commute or for epic weekend adventures, but you are trying to decide which one to buy. Each has its own price, fast stats and speedy claims. You don’t want your high hopes to end in a burned out motor. Here at Mellow we want to give you the best product we can, so you will have a board that you can rely on. Let’s look under the proverbial hood to find out what is the worth of a Mellow and understand if you’re getting that honey for your money. Mellow fits under almost any skateboard giving you power and reliability together with freedom of choice whether you prefer a board that’s flexible or rigid, short or long, with or without a kicktail. With a classic truck mounting system that mounts in minutes, Mellow gives you the choice that most other electric skateboards don’t. Mellow is made by Germans, nice ones that have a big friendly smile. :) It’s a real piece of shred technology that has been designed, developed and built on home asphalt employing local know-how. It’s a meticulously built high-end product, like Germans tend to make. We are not afraid to back our product with a 2 year warranty for the drive system and remote and a 1 year warranty for the battery pack. Like their cars, when Germans make anything with four wheels, it goes fast! A single Mellow Drive pushes you to top speed of 40 km/h (25 mph). Replacing both your skateboard’s trucks by mounting two Mellow Drives in 4WD gives you enough torque to climb crazy hills and blow your hair back with explosive acceleration. Though in-wheel direct drive motors are preferred over belt-systems for reaching higher speeds, Mellow’s custom design dishes out uncharacteristically higher torque: a total of 6 Nm (12 Nm on the 4WD system) of thrust will make you hold onto your hats. A combination of powerful cells, high-end battery management and system design let you climb a maximum grade of 20% to turn that dreadful uphill into a pleasure. Enjoy the ride down with authentic skate feeling thanks to our optimized freewheel rolling, letting you push if you choose. The wheels are replaceable (and upgradable) in seconds, so when you wear down your old treads, just undo a single nut to pop on new ones. Dirty streets shouldn’t scare you since Mellow is rated water and dustproof in IP65 conditions. Hit those puddles - as long as you let any water run off, you’ll be totally fine. Unlike other skates or smartphones, water damage in IP65 conditions (this doesn’t include immersion!) is covered by Mellow's two year warranty. Singing Mellow Submarine in the rain is no problem, just as long as you don’t actually treat it like one - dropping it in a pool or riding into the river (looking at you, Casey Neistat) is a no go. Let’s be honest, although we think that a Mellow will make you call your trip to work or to the bakery a blast the adventure will really begin to unfold on far-off missions past the city walls and off into the horizon, down to the beach or up that mountain. You choose how far you want to go thanks to Mellow's swappable lightweight battery packs. They are safe to travel on planes as proven by the Mellow Team who has criss-crossed the globe with several packs in our carry-ons. If you decide to tackle the Star Wars trilogy (and prequels too, we won’t judge!) while on a transatlantic flight, simply use the pack’s power bank technology to keep your phone juiced. It has the capacity to charge an iPhone 6 several times, leaving you enough charge to ride through the airport. With all that power, Mellow comes with brains too! Its primary braking system stops the board smoothly, feeding energy back into the battery each time as efficiently as possible, while the dual system ensures strong braking where other boards shutdown to protect the battery. Only the Mellow has a dynamic braking resistor letting it re-route excess energy to keep you safe. After all, what good is all that speed without control? 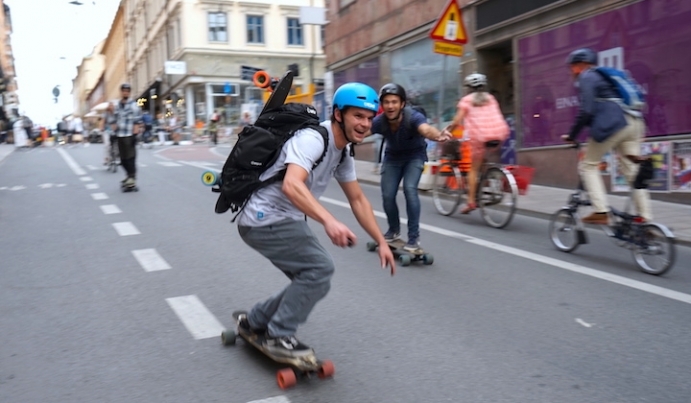 The other main challenge for electric skateboards is overheating. Rolling full speed uphill on a hot summer day will make many engines simply shut off (or switch you to “turtle” mode) to avoid frying like Sunday morning eggs. Mellow’s unique derating technology manages heat by still giving you the highest speeds possible on the fly. The Mellow Drive is programmed to do no harm. It knows when a rider is onboard, deactivating the remote so that an accidental jostle won’t send it flying off a cliff or hitting your best pal in the ankle when you’re distracted tying your shoes or reading the paper. Our 24/7 app support keeps you informed on range per riding mode, distances travelled and battery life. It can get you in touch with the Mellow team for troubleshooting or future developments that will keep you riding longer. Hope to see you in the future riding the Endless Ride. Full speed ahead.